Out of the 20% experiencing psychological issues only 8% of these may need to seek further help. 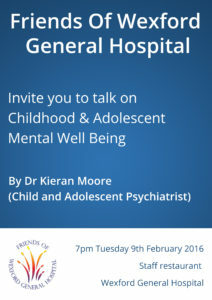 In the latest of the series of talks supported by Friends of Wexford General Hospital, Dr Kieran Moore will highlight the more serious signs to watch out for and how to differentiate between a normal bad mood and something that might be more serious. 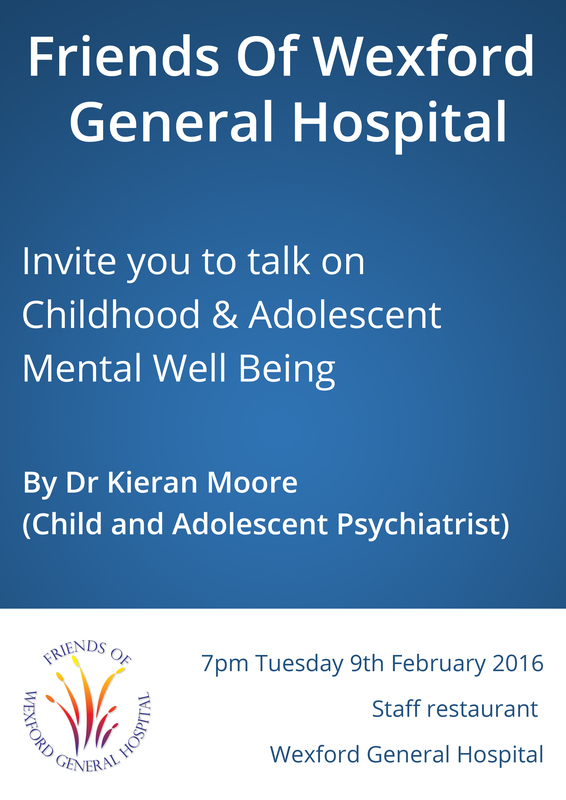 All are welcome to attend Friends Of Wexford General Hospital’s FREE talk on Childhood & Adolescent Mental Well Being at 7pm, Tuesday 9th February in the staff room at Wexford General Hospital. What are the risk factors and how can you avoid them? What is the recipe for your healthy heart? Friends of Wexford Hospital are hosting a heath information talk in plain English by Dr Aidan Buckley, Consultant Cardiologist, on Tuesday next 11th Nov at 7.00 p.m. in the staff canteen of Wexford General Hospital. Dr Buckley has kindly volunteered to outline common cardiac issues in plain English. He will discuss some of the risk factors we should all be aware of and outline a recipe for getting and keeping a healthy heart for you, your friends and family. If you are interested in your heart or that of a loved one, then come along and be informed. Please bring a friend. Are you, a friend or a family member affected by dementia? Understanding Dementia – a talk by Medical Consultant Michael Riordan. Free for all to attend, this event is brought to you by the local Charity Friends of Wexford General Hospital in conjunction with the consultants, management and staff of Wexford General Hospital. Friends of Wexford General Hospital on behalf of the people of Co. Wexford has purchased much needed equipment for infant care and maternity units at Wexford General Hospital. The National Cancer Control Programme has recently accredited Wexford General Hospital as a screening centre for the colorectal cancer screening programme which is to start in 2013. The facilities and standards required to facilitate this programme has been supported by the Friends of Wexford General Hospital donating approximately €20,000 to the screening programme. A project team was set up in Wexford General Hospital with the aim of improving patient experience and patient flow through the Emergency department. The recommendations of the project team are now in place. 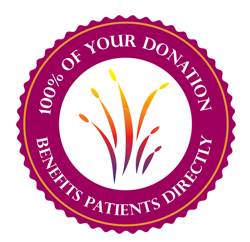 Friends of Wexford General Hospital, through the generous donations from the people of County Wexford, funded the changes made to the Emergency Department. Friends of Wexford General Hospital are delighted to donate two new bronchoscopes and a new colonoscope to the Endoscopy Department at Wexford General Hospital, funded by the generous donations of the people of County Wexford. The bronchoscope is a flexible camera that can be inserted into a person’s air-way to give an accurate view of what is happening. Last year Wexford General Hospital carried out 210 of these procedures mainly as day cases. As the cleaning and sterilization of these endoscopes is vigorous they wear out over time. The two new ones replaced a 7yr and a 9yr old scope. Read More…..